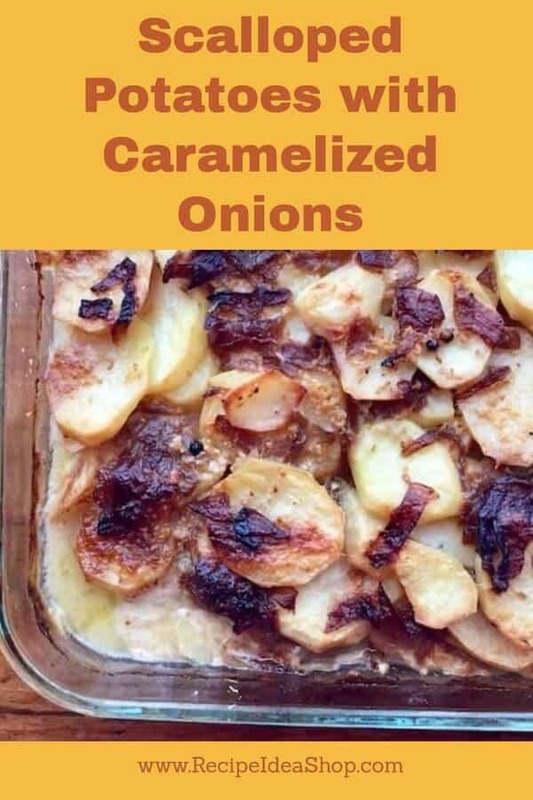 Scalloped Potatoes with Caramelized Onions. The creamiest, most flavorful version of Scalloped Potatoes. We decided to have Ham and Scalloped Potatoes for Christmas supper this year. Because commercial milk hurts my joints, I have to be careful to eat only A2 milk (and A2 cheese), which either comes from goats or from cows that have been tested to be A2. I have invested in a local family farm (Misty Morning Farm) so I am able to get delicious A2 milk, straight from the cow. That way, I get A2 milk that doesn’t cause my body’s inflammation and an allergic response. So, when I found a recipe for Scalloped Potatoes with Caramelized Onions on Food52 that came from Katheryn’s Kitchen, I adapted it to fit my particular needs. The recipe called for Gruyere cheese, but I didn’t have any made from A2 milk. I substituted Pecorino Romano. Since Pecorino Romano is a tasty goat cheese substitute for Parmesan cheese (a hard cheese), and Parmesan goes with just about anything, I thought that would work, and it did. What wonderful Scalloped Potatoes! 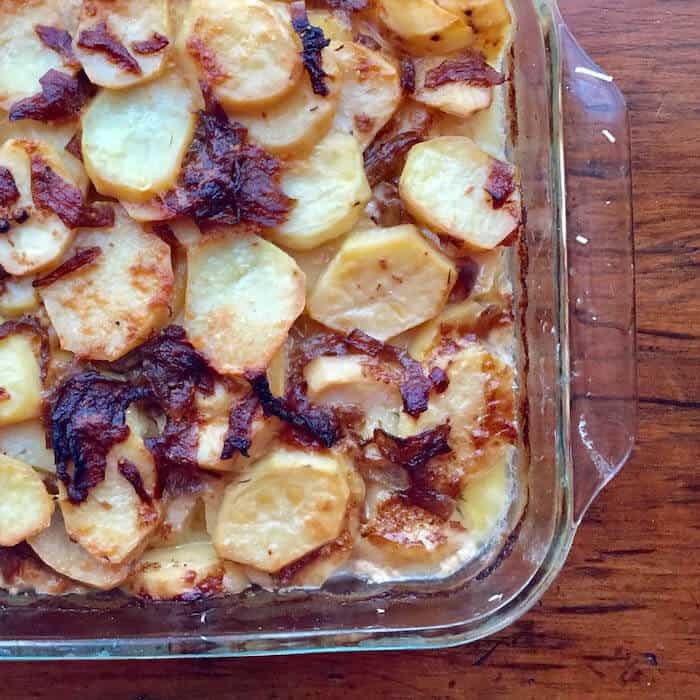 So far, this is my favorite recipe for Scalloped Potatoes and it’s one of our Top Recipes. If you like Caramelized Onions, we have a terrific way to make them without having to stand over the stove. Instant Pot DUO60 6 Qt 7-in-1 Multi-Use Programmable Pressure Cooker, Slow Cooker, Rice Cooker, Steamer, Sauté, Yogurt Maker and Warmer. Buy it on Amazon. In a medium saucepan, heat the cream, garlic, peppercorns, salt and thyme to not quite boiling. Cover and simmer for 12-15 minutes, stirring frequently. Then set aside. In a skillet, heat the oil over medium-high heat. Sauté the onions in the skillet until caramelized (nicely browned). In an 8 x 10 (greased) baking pan, layer the ingredients (similar to lasagna) as follows: potatoes, onions, cheese, potatoes, onions, cheese, etc., ending with cheese. Strain the cream mixture to remove any lumps and pour it over the layered potatoes. Bake at 300F degrees (on a baking sheet to catch drips) for 1.5 to 2 hours until tender. You can make Caramelized Onions in your slow cooker and freeze them to save a step on the recipe! 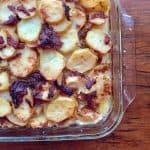 Scalloped Potatoes with Caramelized Onions Nutrition Label. The recipe serves 8. Each serving is about 3/4 cup.